Apologies for the long absence from posting. I find myself without any hours left in a day before I got to everything I wanted to do. And before you know it, more than a month has gone past. In my previous post I presented a quick solution to an Out-of-Band network and I talked about some options. I’ve had mails asking how to show some of the configurations. I’ll cover those and do other posts I have been promising in the next couple days. “3G” is a broad category of standards and services around “broadband” mobile wireless voice and data. Universal Mobile Telecommunications System (UMTS) is part of this family. High Speed Packet Access (HSPA) is a collection of mobile telephony protocols that extend and improve the performance of existing UMTS protocols. Two standards, HSDPA and HSUPA have been established and is fairly well known. Three components are required to use a 3G data connection: a SIM, a radio modem, and a router. The SIM identifies the subscriber (that is you the human) for billing and so forth. The radio modem does the hard work in providing physical layer (Layer1) access to the local 3G base station. The router typically uses PPP as the Layer2 data link to the provider’s Network Access Server (NAS), and from there is connected to the provider’s Layer3 network (which may be a private VPN, or public Internet). The cellular modem must establish a data call, then once connected a PPP session is established to the providers NAS. The cellular modem still requires age-old AT commands to make that call, and additionally to interrogate the SIM, etc. Cisco IOS provides an interface to a handful of modem features via the “cellular” exec command and a chat script(s). Note that AT commands can only be issued when the modem is idle (not in a call). The modem is configured with at least one “profile” which stores an Access Point Name (APN) and optionally a username and password. This profile is then “dialled” to establish the connection similar to using a traditional phone number. These modem profiles are stored on the modem and NOT on the routers NVRAM or flash. Note that a modem profile and an IOS dialer profile are two separate things. Low-speed asynchronous “control” interface which communicates with the modem. High-speed synchronous interface connecting to the cellular providers network. Yes that means you can actually do a reverse telnet to the modem, and configure the AT commands natively. Should you do it? NO, unless you know what you doing. 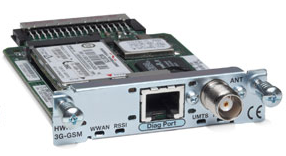 There is also a physical “diag” port (refer to the picture above) on the front of the WIC for low level debugging of the modem. That is just to tease you. You need proprietary software to use that port. Configuring this simple little card. Firstly the 3G-GSM card requires at least Cisco IOS 12.4(15)T1 but I would recommend a higher version for stability purposes. For the Cisco-1841 I downloaded c1841-advipservicesk9-mz.124-24.T3.bin because I needed the extra IOS features. By default most new SIM cards are protected with a PIN code before they could be used (This per Session). This PIN code should be disabled when used with a HWIC-3G-GSM. Next the actual configuration which is required. This configuration might vary based on the cellular provider used (chat-script). Secondly how you plan on using it, tunnel types or plain etc. I will show the config I used to connect to Vodacom South-Africa and using a straight forward cellular interface to connect to anthe Vodacom Internet APN. A PPP tunnel or dialer interface could also be used but it all depends on what you want to accomplish. Lastly the APN must be specified in the modem profile (Here I connected to the Vodacom APN “internet” without any authentication as Vodacom does not require any. Since we using a DDR config, the Cellular interface will only be brought up if there is interesting traffic, either real traffic or traffic created by IP SLA or from the command line. 99 (GPRS Service Code) a digit string (value 99) that identifies a request to use the Packet Domain service. CID (PDP Context Identifier) is the profile number (1..16). There can be multiple profiles in the modem. Apparently, 1 is the default and *1 can be omitted. So ATD*99*1# or the simpler ATD*99# are the most common dial strings. Your modem should not disconnect without intervention. It sounds like the keep alive signal might be incompatible between your modem firmware and your cellular provider. Although the EEM srcipt is a nice quick hack, I would suggest you contact your cellular provider to enquire what hardware version they require for their equipement. Keep in mind different Providers use different firmwares, and some dont support the Sierra Wireless MC8775 modem. Then I would suggest changing your firware to the compatible version. command gave me a great hope but I tried on 5-6 customers and it didn’t work. They push me to reload the router. do you have any other suggestions? Hi, I have a 3G-HWIC-GSM card in a 2811 router with the latest IOS. I am trying to set it up as a DDR link but even just trying to get it set up with MTN for testing purposes as a main link all that happens is the link goes up and down the whole time. When I use the simcard in a normal USB modem it works perfectly. Not sure where to look anymore and any help will be appreciated. What hardware version is your radio? MTN requires v1.1.9.33, and suggests using either IOS 12.4(22)YB4 or 15.0(1)M. I personally would use 15.0(1)M.
(I personally have not tested MTN’s 3G with the 3G-GSM. Another suggestion I might add to rule out hardware is to try a Vodacom sim. I used the Vodacom ‘unrestricted’ APN, but your testing for outbound/uptime should be fine on their ‘internet’ APN. (Note that a Vodacom sim must be activated (free) for their ‘unrestricted’ APN). If the Vodacom sim works fine, I would suggest contacting MTN corporate and request their assistance connecting to their gateways with the 3G-GSM card. I am currently trying to setup two 3g cards on one router, for failover purposes. I get the “primary” 3g card connected, but cannot failover the routing to the 2nd cards, have you or do you know of possible configs for that. I’m assuming you got both interfaces up, each getting an IP and its own connectivity to the big bad net? What router are you using? See the problem with what you are trying is more with return routing than it is with outgoing. It’s will be a messy solution since you have different return ranges routed, but to some degree is possible. You will have to rely on NAT out each interface. But send me a mail with your configs. I’ll see if I can assist. Has it the same behavior with ‘no ip cef’? thanks people very much for your observe,it’s somewhat helpful inside me. I am trying to set up a 3G HWIC card on a 1905 router, and the problem is that i am not able to get a IP address negotiated, however i am able to assign the same IP manually and the ping works fine.. so the problem is that i am not able to get an IP address automatically..
However,if i install the same card in a 1841, it works just fine with a negotiated IP address..i have matched the configs of both the routers , and they are similar.. Kindly suggest what could be the prblm .. The 1905 does support that WIC as per http://bit.ly/bvE4o3. Firstly confirm the IOS you using on the 1905 supports the minimum required IOS for the Hwic. Secondly I’d check the Bug Toolkit for related errors, It does sound like a IOS being grumpy for no reason. I have not used the HWIC on the 1905, but if the documentation says it is supported, it should work. Which leads me to believe it might be IOS bug related. Whether known or unknown. I hate just recommending a IOS upgrade, but might help here. I’d compare that with the equivalent debug from the 1841. Perhaps that can tell why IPCP is not negotiating the address correctly. Ihave one remote site linked with MPLS(IDSL), I have implimented a 3g hwic- hspa as backup link succesfuly, the problem come when the primary link goes down(mpls)the backup interface (3g) does not pick automaticaly, please assit. Can you perhaps mail me your config. Hello from Spain. I have the same problem than Elius. I have a Cisco 2801 witch hwic 3g and one of the interface fast ethernet is conected to vodafone ADSL Router. When the ADSL goes down or enven i do a shutdown on fastethenet interface, the cellular interface not goes up. My advice, add two “ip sla monitors”. The other “ip sla” should be pointing out the cellular interface to the GSM network. With a frequency of 15-30 seconds, the cellular interface should stay up. This sla is used to keep the interface appose to verify reachability, so no “track” required. Since the cellular interface is up, the floating static route pointing out the cellular interface, is always available to become active immediately when the primary default route gets removed. That should take care of the fail-over and teh fail-back. The second part that is crutial is NAT. You must outbound nat and tie it to the interface else your traffic will never know where to return to. Thanks for repply my post. I posted you my running-config from my Cisco Lab. With this router four years ago i passed my CCNA and CCNP exam. Like you can see, there are floating static routes, and backup interface and backup delay in the interface fastEthernet 0/0 connected to the Vodafone Router. its extrange for me that this config doesnt work. Cisco 2801 (revision 6.0) with 241664K/20480K bytes of memory. Thanks for your reply. Your config works fine! The rest of the post is perfect! Keep up the good job! Actually I am looking for out of band management options and this seems to be advanced and cost effective solution as compare to others. But I have below concerns, hope you can answer this. what if routers power goes down? Still I would be able to access the router via 3g by any chance?may be some hidden facts? If my primary link fails, I could access the router via internet? what about security here? Also let me know which technology you will prefer for OOBM for management of 500++ cisco routers around the globe. Unfortunately if you loose power, you will lose access to the router and 3G card. No fancy stuff available there. You can another link as a backup if the 3G dialer interface fails, but that does increase the complexity, and adds another dimension to the security requirements. For the amount of sites you listed and them being global, 3G connectivity might not be the best option as different carriers in different countries operate differently and provide vastly different services. I would suggest looking into the solutions that a company like http://www.avocent.com has to offer. It has been really very intersting to go through all of your tips which are really very helpful. I have a HWIC 3G card installed installed and now planning to get a dedicated ethernet link from my provider which will have a static public IP and will act as a primry link and the 3G link will be the back up. Just want to confirm whther there is any other way other than IP SLA and EEM script to accomplish this instead of using any any inbuilt feature of Cisco IOS. Need your urgnet help …. Tried pinging and debug ppp packet and debug ppp nego,nothing changed/displayed,what are your thoughts? Do i need to configure both sim card slots ? or Can i use any slot to insert my sim card , it does’nt matter? Hi I have configured HWIC 3G GSM interface when i reload the router it works fine after some time interface reset and nothing work when i ping 8.8.8.8 no replay actually the interface is getting IP address can please help me. I Have few Cisco C841M-4X/K9 with flash:c800m-universalk9-mz.SPA.155-3.M.bin. All the location are having similar issue, Radio band goes to Unknown State. I tried forcefully giving technology as GSM, after reboot again the Band is getting selected as auto or unknown.